While it’s just now Winter here in my little part of the world, that hasn’t stopped the dreaded flu from paying me an early visit and overstaying its welcome. For almost three weeks I have been struggling to get back on my feet – literally! After only a couple of days it was obvious that my mind and my body were experiencing a creativity disconnect. While my mind was searching for its creativity fix, my body knew my sewjo needed to take a vacation – and let’s be honest, we all have days when we just aren’t ‘feeling it’ and we need to take a break. Whatever the reason you feel you need to take a break – IT’S OKAY!! While sewing might be my #1 creative outlet of choice there are so many different creative pursuits that require various amounts of energy and time and can be a great substitute for those moments when you can’t sew. I gathered up some pencils and my sketchbook and doodled my way to creative satisfaction and it was fun stretching a different part of my creative muscle. Seeking to be creative in different ways is creative in itself! If I could knit or crochet then I probably would have added that to my bag of creative tricks during these past few weeks but since I am too much of a beginner to do those things without any mental effort I opted for some simple English Paper Piecing instead. I always have some basted hexies sitting in a container ready for any emergency outing that might come up, but when you are craving the company of fabric and thread it’s the perfect emergency indoor pick me up too! 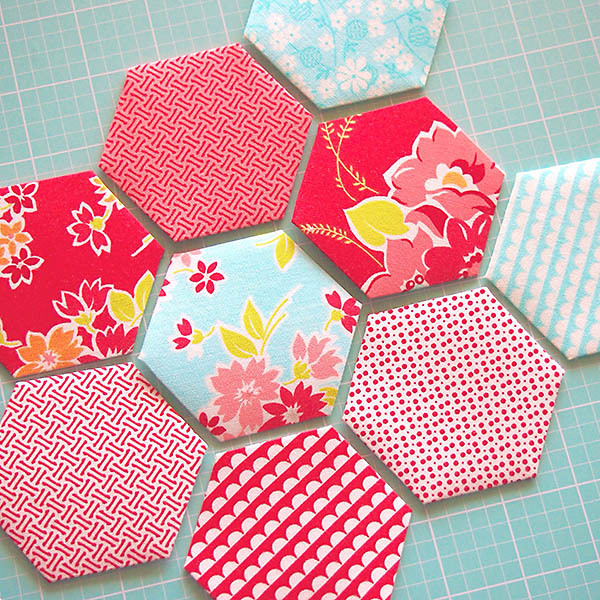 I don’t know if I will ever have enough hexies to actually make a quilt but they are still fun to sew :). If you have the time but don’t have the energy then a browsing session on Pinterest might be just what you need to feel inspired an satiate your creative thirst. Browsing Pinterest is awesome, but BEWARE it can easily become TOO time consuming if you aren’t careful. The best way I have found to ensure I don’t let this happen is to search for inspiration for a specific purpose. Not only does mindful browsing feel more productive, it also helps to focus my mind after the fact and magnifies the inspiration – so whether I’m searching for ideas such as ‘small gifts to sew’ or ‘what cookies to make next Sunday afternoon’ my mind is able to percolate on one specific idea long after I have closed the internet browser and moved on with my day! Have you ever taken a Craftsy class? I have taken quite a few and I love them! I am for the most part a self-taught quilter and I don’t live in an area where I have access to quality teachers so Craftsy has become my go-to place when I want to learn something new, or be taught by some of our industry professionals. As soon as I heard Amy Smart was teaching a class on the platform I knew it was something I was going to make time for, and sitting down on the sofa with my iPad in hand became the perfect creative remedy when my energy levels were particularly low. Amy’s class is called Pre-Cut Shortcuts and Amy has a discount link directly from her site, but there are so many classes to choose from that there really is something for everyone! 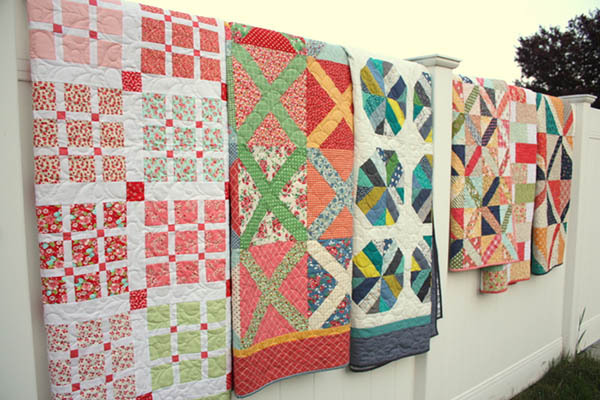 The gorgeous quilts Amy teaches in her Craftsy class! Once upon a time I was a prolific reader, but not so much these days! 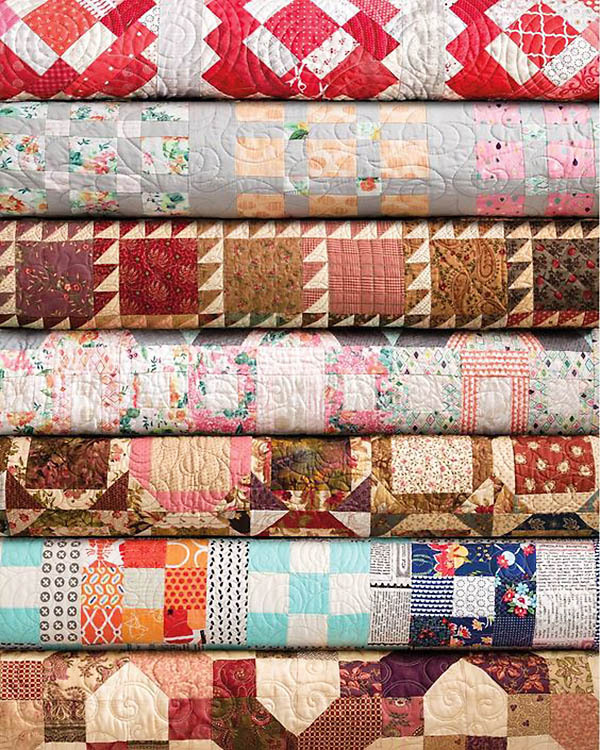 While I could have read a novel while I was wrapped in a quilt on the sofa instead I chose to spend some time browsing the new Moda All Stars – Scraps Made Simple, and making some notes on a pattern I want to make next from Anna Graham’s Handmade Style. If I can’t essentially be creative in a physical sense then I love to feel inspired through words and pictures, and as a bonus I can plan future creative endeavours too (see #9 ;). In an effort to keep my little virus visitor to myself I haven’t actually left the house recently, but thanks to the online world I have been able to have a quick ‘chat’ with friends about their current creative endeavours. Hearing what other people are up to and being able to chat about the current industry happenings such as Spring Quilt Market always makes the world seem like a brighter place and leaves me feeling uplifted and inspired. Thanks friends! There are so many podcasts to choose from these days covering every topic you could think of, and my subscription list is ever-growing! Podcasts are great to listen to in the background when you actually ARE sewing, but they are also a great source of inspiration when you aren’t. Do you have a favourite Podcast I should be listening to? 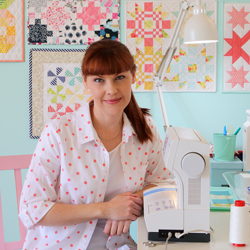 When you are not being distracted by the hum of your sewing machine it is a good time to think, and can be the perfect time to plan some future projects and to re-evaluate your current list of quilty things you want to make. My ideas notebook is really just a running list of possible projects I think I would like to make as well as a list of projects I have started to purchase materials for and a bunch of other quilt related idea lists – but I will be the first to admit that occasionally my lists become a little (okay,…ridiculously) unrealistic and I need to edit and prioritise. 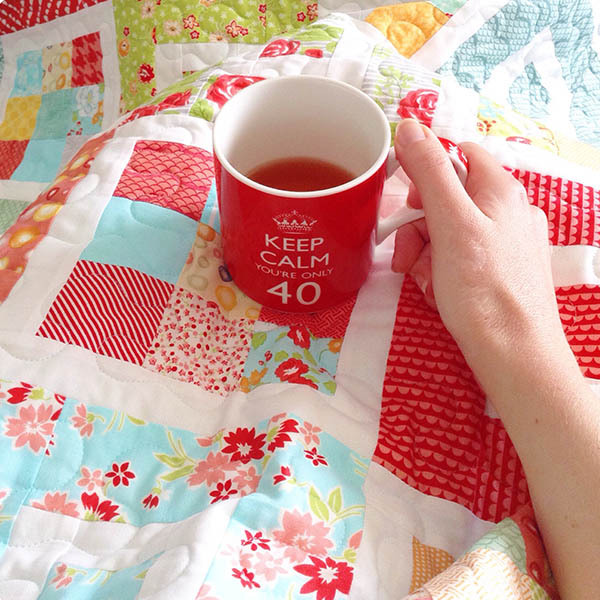 I currently have 30 projects listed in my ‘Make Me’ file, but unless I win some sort of supernatural prize that gives me more hours in each day I am not going to be able to make 30 quilts this year! Simplifying my list by choosing my absolute favourites and creating a ‘Make Me 2016’ file has actually made me more enthusiastic to sew those patterns in the near future. I added some new project ideas and deleted some older ones that no longer held my interest, and all in all it felt good to be a little more organised. Creativity is something to nurture, seek out and embrace – but there is no right or wrong way to be creative. Everyone is different and has different energy levels and demands on their time that allow for different expressions of creativity. I think the key is to be aware that as a creative person you need a creative outlet in order to feel fulfilled and happy. So, no matter what the circumstances are, find what works for you, but keep it real ;). I’m finally starting to see the light at the end of this flu fog tunnel and I am crossing my fingers that with some luck I will be sewing again soon. If you have something you do that fuels your creativity I would love to know, please leave me a comment – remember #7 above ;). Great post! There is so much inspiration in our online world that I sometimes have to make myself take a bit of a creative vacation. Great ideas for slowing down and refocusing! Good to hear you’re feeling better! Thanks Cindy! I’m glad I am not the only one that feels the need to slow down every now and then :). Hi Angela – sitting outside with a bit of sunshine and some stitching sounds like the perfect way to spend an afternoon :).